TORONTO -- It's so CSI. 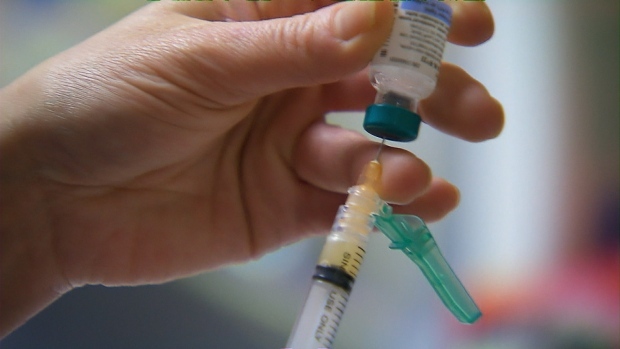 Laboratory testing has solved the mystery of how a little girl from Elliot Lake who had not travelled outside Northern Ontario contracted measles. Work done at Canada's National Microbiology Laboratory in Winnipeg showed that the measles virus that had been picked up by a swab inserted into the little girl's nostril was actually the strain contained in the measles vaccine. Measles vaccine contains a live but weakened virus that induces an immune response but does not trigger the disease. That means something else was almost certainly the cause of the little girl's illness, says Dr. Penny Sutcliffe, acting medical officer of health for the Algoma region, which includes Elliot Lake. "We weren't expecting this result. But in the end I think it's good news for the community and for Northern Ontario at this point in time," says Sutcliffe. How the vaccine virus ended up in the little girl's nose isn't really clear at this point, Sutcliffe admits. The child received a her first dose of measles vaccine last fall. Because it's a live virus vaccine, she could have shed viruses for a short period after she got the shot, even as long as three weeks out from the immunization. But you would not expect to see vaccine viruses in her nose this long after vaccination. Sutcliffe says one hypothesis is that she picked up the vaccine virus at the daycare she attended. Several children at the daycare had recently been vaccinated and were likely shedding viruses. Kids touch things and then stick germ-laden fingers in mouths or nostrils. This doesn't mean the vaccine virus would have made the little girl sick. It was just present. "It's almost like in this situation, because that test is so sensitive, that the virus was picked up almost like a bystander, in a child who also had some illness. She had a rash and some of the symptoms -- not exactly typical of measles -- but did have symptoms of measles," Sutcliffe says. Striking the case from the record means Ontario has recorded a total of 18 cases so far this year, all in the Toronto and Niagara regions. Meanwhile the measles outbreak in Quebec that is linked to the large Disneyland outbreak continues to grow. A spokesperson for the Lanaudiere health region, headquartered at Joliette, says the health unit has now recorded 32 cases, all part of one chain of transmission that started when a person who became infected at Disneyland returned to Quebec.